Replicated directories are a fundamental requirement for delivering a resilient enterprise deployment. OpenLDAP has various configuration options for creating a replicated directory. In previous releases, replication was discussed in terms of a master server and some number of slave servers. A master accepted directory updates from other clients, and a slave only accepted updates from a (single) master. The replication structure was rigidly defined and any particular database could only fulfill a single role, either master or slave. As OpenLDAP now supports a wide variety of replication topologies, these terms have been deprecated in favor of provider and consumer: A provider replicates directory updates to consumers; consumers receive replication updates from providers. Unlike the rigidly defined master/slave relationships, provider/consumer roles are quite fluid: replication updates received in a consumer can be further propagated by that consumer to other servers, so a consumer can also act simultaneously as a provider. Also, a consumer need not be an actual LDAP server; it may be just an LDAP client. The following sections will describe the replication technology and discuss the various replication options that are available. The LDAP Sync Replication engine, syncrepl for short, is a consumer-side replication engine that enables the consumer LDAP server to maintain a shadow copy of a DIT fragment. A syncrepl engine resides at the consumer and executes as one of the slapd(8) threads. It creates and maintains a consumer replica by connecting to the replication provider to perform the initial DIT content load followed either by periodic content polling or by timely updates upon content changes. Syncrepl uses the LDAP Content Synchronization protocol (or LDAP Sync for short) as the replica synchronization protocol. LDAP Sync provides a stateful replication which supports both pull-based and push-based synchronization and does not mandate the use of a history store. In pull-based replication the consumer periodically polls the provider for updates. In push-based replication the consumer listens for updates that are sent by the provider in realtime. Since the protocol does not require a history store, the provider does not need to maintain any log of updates it has received (Note that the syncrepl engine is extensible and additional replication protocols may be supported in the future.). Syncrepl keeps track of the status of the replication content by maintaining and exchanging synchronization cookies. Because the syncrepl consumer and provider maintain their content status, the consumer can poll the provider content to perform incremental synchronization by asking for the entries required to make the consumer replica up-to-date with the provider content. Syncrepl also enables convenient management of replicas by maintaining replica status. 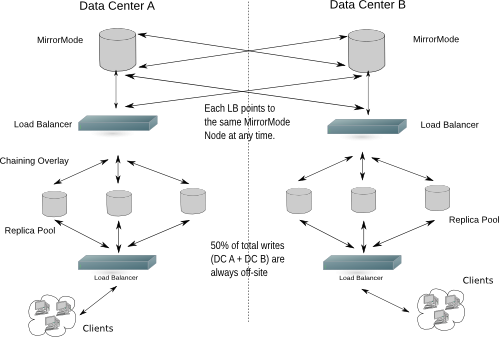 The consumer replica can be constructed from a consumer-side or a provider-side backup at any synchronization status. Syncrepl can automatically resynchronize the consumer replica up-to-date with the current provider content. Syncrepl supports both pull-based and push-based synchronization. In its basic refreshOnly synchronization mode, the provider uses pull-based synchronization where the consumer servers need not be tracked and no history information is maintained. The information required for the provider to process periodic polling requests is contained in the synchronization cookie of the request itself. To optimize the pull-based synchronization, syncrepl utilizes the present phase of the LDAP Sync protocol as well as its delete phase, instead of falling back on frequent full reloads. To further optimize the pull-based synchronization, the provider can maintain a per-scope session log as a history store. In its refreshAndPersist mode of synchronization, the provider uses a push-based synchronization. The provider keeps track of the consumer servers that have requested a persistent search and sends them necessary updates as the provider replication content gets modified. With syncrepl, a consumer server can create a replica without changing the provider's configurations and without restarting the provider server, if the consumer server has appropriate access privileges for the DIT fragment to be replicated. The consumer server can stop the replication also without the need for provider-side changes and restart. Syncrepl supports partial, sparse, and fractional replications. The shadow DIT fragment is defined by a general search criteria consisting of base, scope, filter, and attribute list. The replica content is also subject to the access privileges of the bind identity of the syncrepl replication connection. The LDAP Sync protocol allows a client to maintain a synchronized copy of a DIT fragment. The LDAP Sync operation is defined as a set of controls and other protocol elements which extend the LDAP search operation. This section introduces the LDAP Content Sync protocol only briefly. For more information, refer to RFC4533. The LDAP Sync protocol supports both polling and listening for changes by defining two respective synchronization operations: refreshOnly and refreshAndPersist. Polling is implemented by the refreshOnly operation. The consumer polls the provider using an LDAP Search request with an LDAP Sync control attached. The consumer copy is synchronized to the provider copy at the time of polling using the information returned in the search. The provider finishes the search operation by returning SearchResultDone at the end of the search operation as in the normal search. Listening is implemented by the refreshAndPersist operation. As the name implies, it begins with a search, like refreshOnly. Instead of finishing the search after returning all entries currently matching the search criteria, the synchronization search remains persistent in the provider. Subsequent updates to the synchronization content in the provider cause additional entry updates to be sent to the consumer. The refreshOnly operation and the refresh stage of the refreshAndPersist operation can be performed with a present phase or a delete phase. In the present phase, the provider sends the consumer the entries updated within the search scope since the last synchronization. The provider sends all requested attributes, be they changed or not, of the updated entries. For each unchanged entry which remains in the scope, the provider sends a present message consisting only of the name of the entry and the synchronization control representing state present. The present message does not contain any attributes of the entry. After the consumer receives all update and present entries, it can reliably determine the new consumer copy by adding the entries added to the provider, by replacing the entries modified at the provider, and by deleting entries in the consumer copy which have not been updated nor specified as being present at the provider. The transmission of the updated entries in the delete phase is the same as in the present phase. The provider sends all the requested attributes of the entries updated within the search scope since the last synchronization to the consumer. In the delete phase, however, the provider sends a delete message for each entry deleted from the search scope, instead of sending present messages. The delete message consists only of the name of the entry and the synchronization control representing state delete. The new consumer copy can be determined by adding, modifying, and removing entries according to the synchronization control attached to the SearchResultEntry message. In the case that the LDAP Sync provider maintains a history store and can determine which entries are scoped out of the consumer copy since the last synchronization time, the provider can use the delete phase. If the provider does not maintain any history store, cannot determine the scoped-out entries from the history store, or the history store does not cover the outdated synchronization state of the consumer, the provider should use the present phase. The use of the present phase is much more efficient than a full content reload in terms of the synchronization traffic. To reduce the synchronization traffic further, the LDAP Sync protocol also provides several optimizations such as the transmission of the normalized entryUUIDs and the transmission of multiple entryUUIDs in a single syncIdSet message. At the end of the refreshOnly synchronization, the provider sends a synchronization cookie to the consumer as a state indicator of the consumer copy after the synchronization is completed. The consumer will present the received cookie when it requests the next incremental synchronization to the provider. When refreshAndPersist synchronization is used, the provider sends a synchronization cookie at the end of the refresh stage by sending a Sync Info message with refreshDone=TRUE. It also sends a synchronization cookie by attaching it to SearchResultEntry messages generated in the persist stage of the synchronization search. During the persist stage, the provider can also send a Sync Info message containing the synchronization cookie at any time the provider wants to update the consumer-side state indicator. In the LDAP Sync protocol, entries are uniquely identified by the entryUUID attribute value. It can function as a reliable identifier of the entry. The DN of the entry, on the other hand, can be changed over time and hence cannot be considered as the reliable identifier. The entryUUID is attached to each SearchResultEntry or SearchResultReference as a part of the synchronization control. The syncrepl engine utilizes both the refreshOnly and the refreshAndPersist operations of the LDAP Sync protocol. If a syncrepl specification is included in a database definition, slapd(8) launches a syncrepl engine as a slapd(8) thread and schedules its execution. If the refreshOnly operation is specified, the syncrepl engine will be rescheduled at the interval time after a synchronization operation is completed. If the refreshAndPersist operation is specified, the engine will remain active and process the persistent synchronization messages from the provider. The syncrepl engine utilizes both the present phase and the delete phase of the refresh synchronization. It is possible to configure a session log in the provider which stores the entryUUIDs of a finite number of entries deleted from a database. Multiple replicas share the same session log. The syncrepl engine uses the delete phase if the session log is present and the state of the consumer server is recent enough that no session log entries are truncated after the last synchronization of the client. The syncrepl engine uses the present phase if no session log is configured for the replication content or if the consumer replica is too outdated to be covered by the session log. The current design of the session log store is memory based, so the information contained in the session log is not persistent over multiple provider invocations. It is not currently supported to access the session log store by using LDAP operations. It is also not currently supported to impose access control to the session log. As a further optimization, even in the case the synchronization search is not associated with any session log, no entries will be transmitted to the consumer server when there has been no update in the replication context. The syncrepl engine, which is a consumer-side replication engine, can work with any backends. The LDAP Sync provider can be configured as an overlay on any backend, but works best with the back-bdb, back-hdb, or back-mdb backends. The LDAP Sync provider maintains a contextCSN for each database as the current synchronization state indicator of the provider content. It is the largest entryCSN in the provider context such that no transactions for an entry having smaller entryCSN value remains outstanding. The contextCSN could not just be set to the largest issued entryCSN because entryCSN is obtained before a transaction starts and transactions are not committed in the issue order. The provider stores the contextCSN of a context in the contextCSN attribute of the context suffix entry. The attribute is not written to the database after every update operation though; instead it is maintained primarily in memory. At database start time the provider reads the last saved contextCSN into memory and uses the in-memory copy exclusively thereafter. By default, changes to the contextCSN as a result of database updates will not be written to the database until the server is cleanly shut down. A checkpoint facility exists to cause the contextCSN to be written out more frequently if desired. Note that at startup time, if the provider is unable to read a contextCSN from the suffix entry, it will scan the entire database to determine the value, and this scan may take quite a long time on a large database. When a contextCSN value is read, the database will still be scanned for any entryCSN values greater than it, to make sure the contextCSN value truly reflects the greatest committed entryCSN in the database. On databases which support inequality indexing, setting an eq index on the entryCSN attribute and configuring contextCSN checkpoints will greatly speed up this scanning step. If no contextCSN can be determined by reading and scanning the database, a new value will be generated. Also, if scanning the database yielded a greater entryCSN than was previously recorded in the suffix entry's contextCSN attribute, a checkpoint will be immediately written with the new value. The consumer also stores its replica state, which is the provider's contextCSN received as a synchronization cookie, in the contextCSN attribute of the suffix entry. The replica state maintained by a consumer server is used as the synchronization state indicator when it performs subsequent incremental synchronization with the provider server. It is also used as a provider-side synchronization state indicator when it functions as a secondary provider server in a cascading replication configuration. Since the consumer and provider state information are maintained in the same location within their respective databases, any consumer can be promoted to a provider (and vice versa) without any special actions. Because a general search filter can be used in the syncrepl specification, some entries in the context may be omitted from the synchronization content. The syncrepl engine creates a glue entry to fill in the holes in the replica context if any part of the replica content is subordinate to the holes. The glue entries will not be returned in the search result unless ManageDsaIT control is provided. Also as a consequence of the search filter used in the syncrepl specification, it is possible for a modification to remove an entry from the replication scope even though the entry has not been deleted on the provider. Logically the entry must be deleted on the consumer but in refreshOnly mode the provider cannot detect and propagate this change without the use of the session log on the provider. For configuration, please see the Syncrepl section. While the LDAP Sync specification only defines a narrow scope for replication, the OpenLDAP implementation is extremely flexible and supports a variety of operating modes to handle other scenarios not explicitly addressed in the spec. LDAP Sync replication is an object-based replication mechanism. When any attribute value in a replicated object is changed on the provider, each consumer fetches and processes the complete changed object, including both the changed and unchanged attribute values during replication. One advantage of this approach is that when multiple changes occur to a single object, the precise sequence of those changes need not be preserved; only the final state of the entry is significant. But this approach may have drawbacks when the usage pattern involves single changes to multiple objects. For example, suppose you have a database consisting of 102,400 objects of 1 KB each. Further, suppose you routinely run a batch job to change the value of a single two-byte attribute value that appears in each of the 102,400 objects on the master. Not counting LDAP and TCP/IP protocol overhead, each time you run this job each consumer will transfer and process 100 MB of data to process 200KB of changes! 99.98% of the data that is transmitted and processed in a case like this will be redundant, since it represents values that did not change. This is a waste of valuable transmission and processing bandwidth and can cause an unacceptable replication backlog to develop. While this situation is extreme, it serves to demonstrate a very real problem that is encountered in some LDAP deployments. Delta-syncrepl, a changelog-based variant of syncrepl, is designed to address situations like the one described above. Delta-syncrepl works by maintaining a changelog of a selectable depth in a separate database on the provider. The replication consumer checks the changelog for the changes it needs and, as long as the changelog contains the needed changes, the consumer fetches the changes from the changelog and applies them to its database. If, however, a replica is too far out of sync (or completely empty), conventional syncrepl is used to bring it up to date and replication then switches back to the delta-syncrepl mode. Note: since the database state is stored in both the changelog DB and the main DB on the provider, it is important to backup/restore both the changelog DB and the main DB using slapcat/slapadd when restoring a DB or copying it to another machine. For configuration, please see the Delta-syncrepl section. 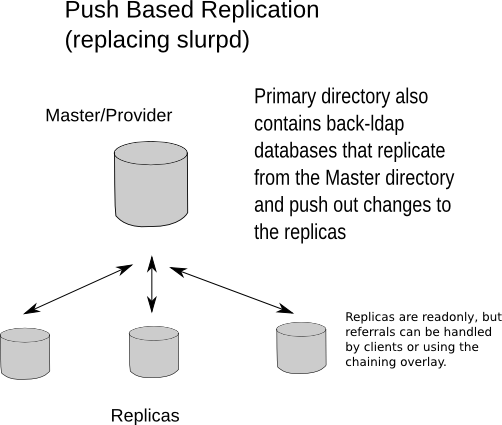 Multi-Master replication is a replication technique using Syncrepl to replicate data to multiple provider ("Master") Directory servers. Providers can be located in several physical sites i.e. distributed across the network/globe. Providers must propagate writes to all the other servers, which means the network traffic and write load spreads across all of the servers the same as for single-master. Server utilization and performance are at best identical for Multi-Master and Single-Master replication; at worst Single-Master is superior because indexing can be tuned differently to optimize for the different usage patterns between the provider and the consumers. While the LDAP Sync protocol supports both pull- and push-based replication, the push mode (refreshAndPersist) must still be initiated from the consumer before the provider can begin pushing changes. In some network configurations, particularly where firewalls restrict the direction in which connections can be made, a provider-initiated push mode may be needed. This mode can be configured with the aid of the LDAP Backend (Backends and slapd-ldap(8)). Instead of running the syncrepl engine on the actual consumer, a slapd-ldap proxy is set up near (or collocated with) the provider that points to the consumer, and the syncrepl engine runs on the proxy. For configuration, please see the Syncrepl Proxy section. The old slurpd mechanism only operated in provider-initiated push mode. 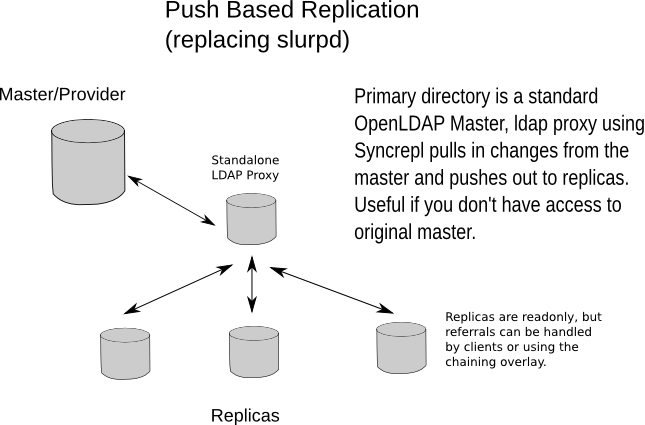 Slurpd replication was deprecated in favor of Syncrepl replication and has been completely removed from OpenLDAP 2.4. Because syncrepl is a consumer-side replication engine, the syncrepl specification is defined in slapd.conf(5) of the consumer server, not in the provider server's configuration file. The initial loading of the replica content can be performed either by starting the syncrepl engine with no synchronization cookie or by populating the consumer replica by loading an LDIF file dumped as a backup at the provider. When loading from a backup, it is not required to perform the initial loading from the up-to-date backup of the provider content. The syncrepl engine will automatically synchronize the initial consumer replica to the current provider content. As a result, it is not required to stop the provider server in order to avoid the replica inconsistency caused by the updates to the provider content during the content backup and loading process. When replicating a large scale directory, especially in a bandwidth constrained environment, it is advised to load the consumer replica from a backup instead of performing a full initial load using syncrepl. The provider is implemented as an overlay, so the overlay itself must first be configured in slapd.conf(5) before it can be used. The provider has two primary configuration directives and two secondary directives for when delta-syncrepl is being used. Because the LDAP Sync search is subject to access control, proper access control privileges should be set up for the replicated content. The two primary options to configure are the checkpoint and sessionlog behaviors. directive. Checkpoints are only tested after successful write operations. If <ops> operations or more than <minutes> time has passed since the last checkpoint, a new checkpoint is performed. Checkpointing is disabled by default. directive, where <ops> is the maximum number of session log entries the session log can record. All write operations (except Adds) are recorded in the log. Note that using the session log requires searching on the entryUUID attribute. Setting an eq index on this attribute will greatly benefit the performance of the session log on the provider. directive. It must be set TRUE when using the accesslog overlay for delta-based syncrepl replication support. The default is FALSE. The nonpresent option should only be configured if the overlay is being placed on top of a log database, such as when used with delta-syncrepl. directive. This value should only be set TRUE for a syncprov instance on top of a log database (such as one managed by the accesslog overlay). The default is FALSE. The syncrepl replication is specified in the database section of slapd.conf(5) for the replica context. The syncrepl engine is backend independent and the directive can be defined with any database type. In this example, the consumer will connect to the provider slapd(8) at port 389 of ldap://provider.example.com to perform a polling (refreshOnly) mode of synchronization once a day. It will bind as cn=syncuser,dc=example,dc=com using simple authentication with password "secret". Note that the access control privilege of cn=syncuser,dc=example,dc=com should be set appropriately in the provider to retrieve the desired replication content. Also the search limits must be high enough on the provider to allow the syncuser to retrieve a complete copy of the requested content. The consumer uses the rootdn to write to its database so it always has full permissions to write all content. The synchronization search in the above example will search for the entries whose objectClass is organizationalPerson in the entire subtree rooted at dc=example,dc=com. The requested attributes are cn, sn, ou, telephoneNumber, title, and l. The schema checking is turned off, so that the consumer slapd(8) will not enforce entry schema checking when it processes updates from the provider slapd(8). For more detailed information on the syncrepl directive, see the syncrepl section of The slapd Configuration File chapter of this admin guide. The provider slapd(8) is not required to be restarted. contextCSN is automatically generated as needed: it might be originally contained in the LDIF file, generated by slapadd (8), generated upon changes in the context, or generated when the first LDAP Sync search arrives at the provider. If an LDIF file is being loaded which did not previously contain the contextCSN, the -w option should be used with slapadd (8) to cause it to be generated. This will allow the server to startup a little quicker the first time it runs. When starting a consumer slapd(8), it is possible to provide a synchronization cookie as the -c cookie command line option in order to start the synchronization from a specific state. The cookie is a comma separated list of name=value pairs. Currently supported syncrepl cookie fields are csn=<csn> and rid=<rid>. <csn> represents the current synchronization state of the consumer replica. <rid> identifies a consumer replica locally within the consumer server. It is used to relate the cookie to the syncrepl definition in slapd.conf(5) which has the matching replica identifier. The <rid> must have no more than 3 decimal digits. The command line cookie overrides the synchronization cookie stored in the consumer replica database. # subsequent rules. See slapd.access(5) for details. The above configuration assumes that you have a replicator identity defined in your database that can be used to bind to the provider. In addition, all of the databases (primary, replica, and the accesslog storage database) should also have properly tuned DB_CONFIG files that meet your needs. Note: An accesslog database is unique to a given master. It should never be replicated. Now start up the Master and a consumer/s, also add the above LDIF to the first consumer, second consumer etc. It will then replicate cn=config. You now have N-Way Multimaster on the config database. Note: All of your servers' clocks must be tightly synchronized using e.g. NTP http://www.ntp.org/, atomic clock, or some other reliable time reference. Note: As stated in slapd-config(5), URLs specified in olcSyncRepl directives are the URLs of the servers from which to replicate. These must exactly match the URLs slapd listens on (-h in Command-Line Options). Otherwise slapd may attempt to replicate from itself, causing a loop. Note: You need to make sure that the serverID of each mirror node is different and add it as a global configuration option. The first step is to configure the syncrepl provider the same as in the Set up the provider slapd section. It's simple really; each MirrorMode node is setup exactly the same, except that the serverID is unique, and each consumer is pointed to the other server. This is exactly the same as the Set up the consumer slapd section. It can either setup in normal syncrepl replication mode, or in delta-syncrepl replication mode. You will now have a directory architecture that provides all of the consistency guarantees of single-master replication, while also providing the high availability of multi-master replication. # merged with other ACL statements. In order to support more replicas, just add more database ldap sections and increment the syncrepl rid number accordingly. As you can see, you can let your imagination go wild using Syncrepl and slapd-ldap(8) tailoring your replication to fit your specific network topology.